I used the Have I been pwned? site to identify a breach containing the email in question. 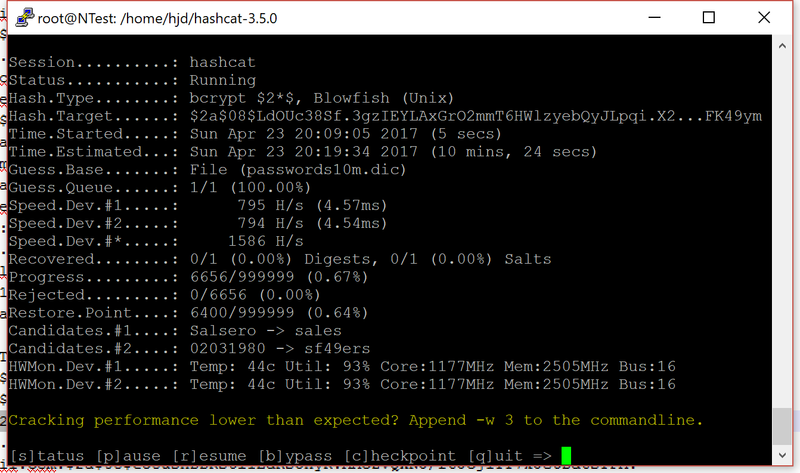 This led me to a hash from the 2012 Dropbox breach (available in various locations in the less salubrious areas of the ‘net), and we’ll use the magnificent Hashcat to calculate hashes from a wordlist to find the password. I’ve had, since my days as an InfoSec consultant, a number of wordlists used for this kind of thing. In this case I’ll use a file of 10 million common passwords. With my allocation of free Azure credits I can spin up one of the new(ish) Azure NVidia GPU VMs. For the time being these are only available in a few regions and with specific configurations. When creating the VM you’ll need to choose a US region (I put mine on the East coast) and must choose HDD for disk type as SSDs are not available on the NV VMs yet. I chose the Standard NV12 which has 12 cores and 112 GB memory – but cores and RAM are not important for our purposes – we care about the 2x M60 GPUs. For the OS, I’m running Ubuntu 16.04 LTS. Replace hashcat-3.5.0.7z with whatever is current on the hashcat site. Next, update the blacklist to disable the standard drivers. We’ll install the NVidia drivers we just downloaded after a reboot. You’ll also have to update the X configuration – I said yes, but it didn’t matter for what we’re doing. 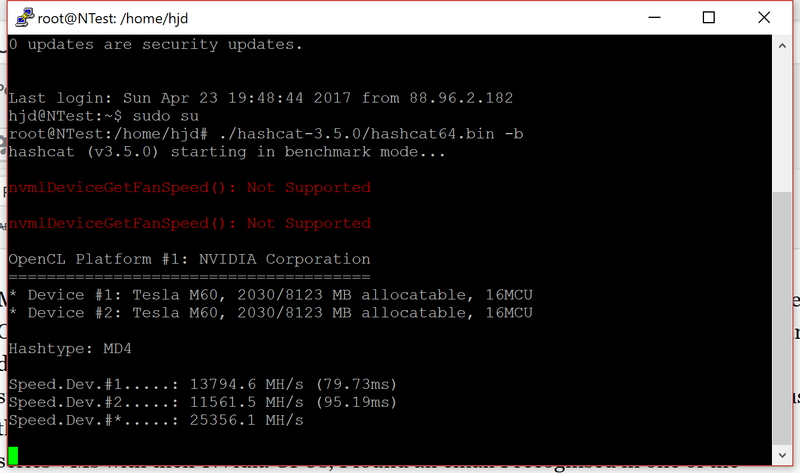 It’ll continue to run the benchmarks for all the hashes it is capable of calculating. I’ll cover more complex cracks – where hashcat modifies the content of the wordlist with rules – in a future post. This server would cost 1200 quid a month to keep running non-stop, but as with any Azure VM you can shutdown and “deallocate” it to stop paying for the compute. The cost of setting up this VM, and running it for about 10 minutes to calculate the hash I needed was a couple of quid. When I need it again I can restart it in the Azure portal – connect to the new IP it gets, and away I go.